My daughter, Hannah loves watching the popular Disney Junior television show, Sofia the First. Therefore, she was so excited to watch the newest DVD release of Sofia the First-The Floating Palace ($14.95). This exciting full-length, The Floating Palace, features Sofia and her friend, a young mermaid named Oona. Sofia’s magical amulet allows her to transform herself into a mermaid so that she can visit her friends in their undersea kingdom. As she and her pals are having fun exploring under the sea, Cedric transforms himself into a sea monster who wants to steal Oona’s enchanted Mermaid Comb. Will Sofia, Oona and her mermaid friends escape from this dangerous plot or will both worlds be threatened by Cedric? As Sofia heads out to rescue her friend, my daughter was delighted (she actually shouted out with joy) when another famous mermaid, the beautiful Princess Ariel arrives and is ready to help her with the search. Sofia and Ariel work together to save Oona and prevent Cedric from creating a typhoon that would be devastating to both worlds. What Hannah and I both enjoy about this show is that it has excellent animation, relatable characters and interesting story lines. Sofia is a strong young female character who is always smart and kind. I also appreciate that the episodes focus on themes such as friendship, working together and the importance of family…..all things that we value too! The Floating Palace is fun and exciting and my daughter loved that it has an ocean theme because she enjoyed seeing the undersea world “come to life”. In addition to the title episode featured on this DVD it also includes three additional episodes including the Tri-Kingdom Picnic, Finding Clover and Make Way For Miss Nettle for a whopping total run time of approximately 118 minutes. We have a small DVD player that I always keep in my truck and recently Hannah had an accident that required plastic surgery on her face. While we were in the room at the hospital waiting for surgery, Hannah was very scared. I remembered that I had this DVD with us in the truck and it brought great comfort to Hannah to be able to watch one of the additional episodes as we waited for her surgery time. This is a must-have DVD for any Sofia the First fan as it is very entertaining. 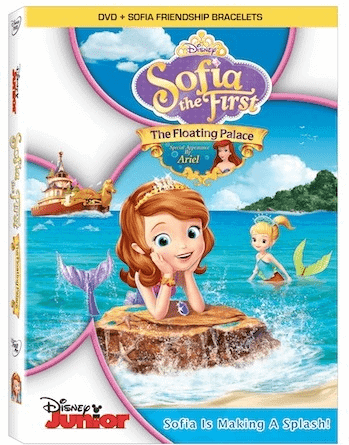 Sofia the First-The Floating Palace is now available for purchase at retailers online including the Disney Store! It even comes with exclusive Friendship Bracelets which Hannah is excited to share with her best friends! Another super cute DVD, thank-you! How fun–I need some new kiddie entertainment here! Sofia is my daughter’s favorite princess. I just have to say that my three year old niece has been with us for the last three weeks and she’s watched Princess Sofia every day since I bought the original dvd. She wears her purple princess dress up clothes and insists I call her princess sofia. I’m pretty sure she’s the biggest princess sofia fan out there.